Since 2007 nearly half a million GyapaTM stoves have been sold in Ghana, improving the lives of more than 2.4 million people and saving them over $40million in fuel costs. The GyapaTM stove technology cuts charcoal use by up to 50% and reduces harmful smoke emission and household air pollution. Introduced to Ghana in 2002, by EnterpriseWorks, a division of Relief International (RI/EW), GyapaTM is the most popular improved cookstove in Ghana and is now the largest locally produced improved cookstove industry in Africa and one of the largest cookstove carbon financing schemes under Gold Standard. GyapaTM stoves are sold in four different sizes to accommodate domestic and commercial cooking needs, providing significant socioeconomic, environmental, and health benefits to stove users and their communities. 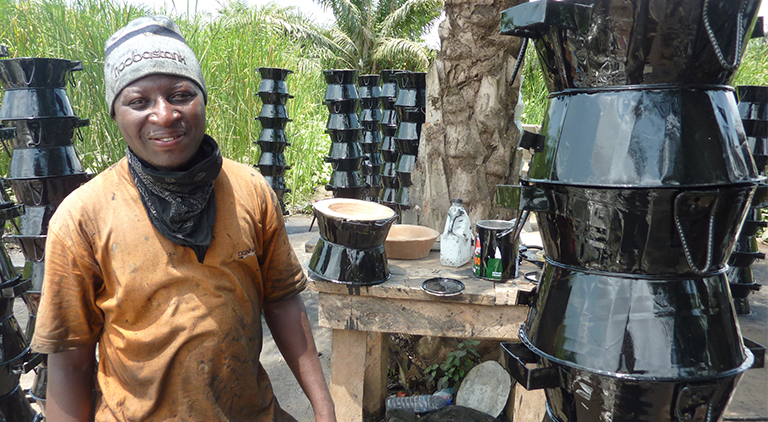 By partnering with and investing in local entrepreneurs to manufacture, distribute and sell the stoves, the project supports over 400 independent producers and 500 retail agents throughout Ghana; with over 11,000 stoves currently being produced and sold each month. But this is not charity. ClimateCare helped unlock private sector finance for this project, which was registered as a carbon finance programme in late 2007. We continue to sell the resulting carbon credits to organisations around the world, which use the credits to offset their own unavoidable carbon emissions. This revenue stream is invested back into the project and we’re delighted to see private sector finance having such a positive impact on the lives of Ghanaian people. “With the support of ClimateCare, carbon finance has enabled RI/EW to take a market based approach to the GyapaTM program in Ghana and turn it into a self-sustaining model for success across the sector. ClimateCare’s unparalleled expertise in the carbon market has resulted in the continued sale of GyapaTM carbon credits which has provided the necessary investment for continued growth and success,” states Chip Levengood, RI Board Chairperson. ClimateCare has arranged the purchase and sales of VERs from the Gyapa project in Ghana since 2007.